It’s a metal box, slightly longer than wide, slightly wider than deep. A black metal box, like one I once owned, with a clasp at the front for a padlock. And there, ignored by the benthic beasts and the other inhabitants of the abyss – the giant squids and the angler fish, self-illuminated monsters of the deep – it calls. And nobody hears. Even though we are listening for it. Listening with all the technology that we possess. Maybe it’s here and maybe it’s there. 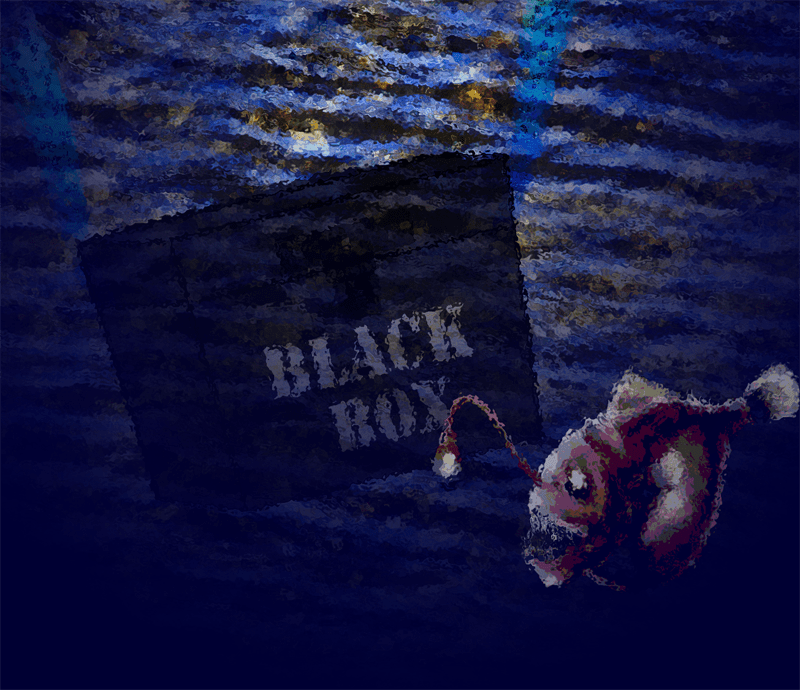 The search goes on up above, but nobody knows where it is and though it tries and tries, for days and weeks, eventually its batteries weaken, the sound dies and finally the black box lies in silence at the bottom of the ocean and its memories are lost. Water carries sound far, far further than the air carries it. To our ears it appears muted, but to the sea’s creatures the sound of the sea is rich. And nowadays, since man increasingly has polluted the ocean also with noise, it is cacophony. To hear some of the sounds of the sea visit this BBC website. The anglerfish in the illustration started life on the pages of Wikimedia commons. I originally published this article on the separate At the Quill website. I revised it for spelling and carried out some SEO fine-tuning – and added a featured image – before transferring it here on 30 March 2017.